That's me on day one of the PCT, all shiny and clean smelling. The scoop I made has survived over 2300 miles of hiking and is still going strong. Many hikers use 1L Smartwater bottles. They're durable and light, weighing only 1.7 ounces. Poland Spring's 1.5L bottle holds more liquid and yet weighs a mere 1.0 ounces. Make a template by wrapping a piece of paper around your drinking bottle, and tape it so it stays in place—like a paper tube extending below the bottom of the bottle. Leave 4 or 5 inches of overlap below the bottom of the drinking bottle. 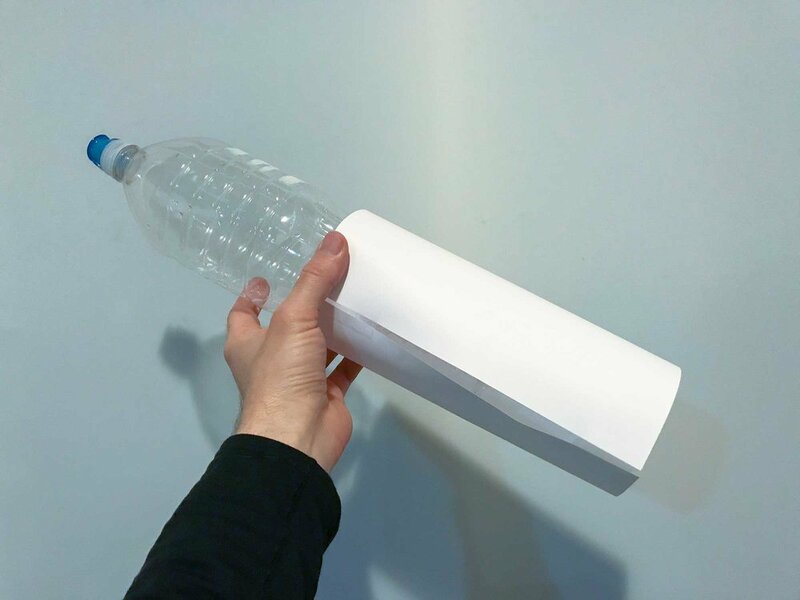 Make a template of the diameter of your inner bottle using paper and tape. Fit it overtop of the outer (scoop) bottle. Trace the template with a sharpie to mark where to cut. Place this over the top of the bottle you intend to convert into a scoop. Because this bottle is wider, it should stop part way down the taper. Make sure the template edge is level and trace it with a sharpie. Use a box cutter to remove the top, being careful to cut a nice clean edge. Clean up the edge with a scissors if you need to. If there are burrs or sharp points, you may want to use a file or sandpaper to smooth it down. Poking your hands with tiny plastic slivers is no fun. Carefully remove the top using a box cutter. Clean up the edge with a scissors or a file. Step 3: Test the fit. Test out the fit. You want it to be snug enough that it doesn't fall out when you bend over with your pack on. Ideally your drinking bottle should slide smoothly into the scoop. Be careful if building the scoop to fit the 1L Smartwater. Because the Essentia bottle is quite a bit wider, you have to get the cut on the taper right. If it’s too low down on the bottle, your Smartwater bottle will rattle around inside and may fall out of your pack when you lean forward. Aim for a snug enough fit that the bottles stay nested when you shift or invert your pack. You’re all set! This little hack saved me tons of time on the PCT. I was able to use this scoop to easily grab water from all kinds of less than desirable sources. The nested design protects the lightweight plastic from damage and consumes very little additional space in the pack. The one I built for the PCT has survived over 2300 miles and is still going strong. Do you use a scoop to gather water in the backcountry? Do you have a clever ultralight hack for your hydration system? Share your tips and tricks in the comments below!